Senior Lecturer at the School of Social Science, History and Philosophy at Birkbeck, University of London. I was thinking today of my friend Bukola, who left this world just over 20 years ago this month. It made me dig this piece out, which I wrote ten years later, which was published in the CUCR magazine Street Signs in Autumn 2008. The Paul here is Paul Hendrich, who died tragically young ten years ago, in January 2018. It is at train stations that I am most often visited by ghosts. Yesterday, at Waterloo East, I saw my friend Paul pushing his daughter in a buggy. As he came nearer and his image clarified, I realised that of course it was not him – those sideburns, that orange shirt belonged to another man – and a wave of grief hits me, thinking of the friend I no longer have, but especially the father his daughter no longer has. Less frequently now than before, but still with surprising regularity, I see Bukola at London Bridge station, a glimpse amongst the crowds boarding and alighting from the trains in and out of the city. Sometimes her hair is cropped short, sometimes bleached yellow, her smile a white dazzle amongst the blur of passengers. Bukola was my close friend for four years, nearly fifteen years ago. I find her present too in Paul Auster’s New York Trilogy, a book she lent me which I have been unable to finish but still morbidly pick at from time to time. It reminds me of a grim few days when I struggled with it in the inauspicious environment of the surgical in-patients ward at King’s in Camberwell. The memory of my brief hospitalisation inevitably triggers the far grimmer memory of later visits to Bukola in the psychiatric wing in the tower of Guy’s in the final months of her life. The muted television. The nodding inmates endlessly sipping tea and repeatedly tapping barely smoked cigarettes in the ashtray. The lack of privacy these men and women had. Bukola’s copy of the Trilogy has passages underlined and highlighted. I have no way of knowing if she emphasised them, or bought the book second hand, already notated. I find arcane significance, clues to her death, in these phrases and paragraphs: depressing images of urban anonymity, paranoid fantasies of being followed along city blocks, Manhattan’s cityscape as an illegible labyrinth. The regularity with which Bukola comes to me at London Bridge, I think, has to do with the survivor’s guilt associated with suicide: perhaps if I’d acted differently, if I’d held out the hand of friendship more fulsomely, more unconditionally, she would have made different decisions. I think of Bukola, as Antonin Artaud described Van Gogh, as suicided by society. Her imagination, her creativity, her energy burnt too brightly, too vividly, too intensely for this world. I have no doubt that the everyday drip-drip of racism was part of Bukola’s illness, the non-verbal geographies of suspicion and interdiction that black Londoners navigate; in her episodes, Bukola frequently experienced herself as a black dog. Rye market, or teasing us for acting like bumpkins at Soho post-production parties she snuck us into. I thought then I would never lose the wonder of the metropolis, the bedazzlement and sensory overload in the face of London’s hugeness and variousness, of the city sublime. But over the years I find myself cultivating what the sociologist Simmel called the blasé attitude, the shock-resistance techniques of the urbanite – the defence system Bukola never mastered. And with that blasé attitude comes a little less wonder. Until she appears again from out of the throng at London Bridge. A really insightful and provocative review essay by Anya Topolski on Antisemitism and Islamophobia in Europe: A Shared Story? edited by James Renton and me, and Whites, Jews, and Us: Towards a Politics of Revolutionary Love by Houria Bouteldja. Some really nice words, and makes some important criticisms too. Race remains a taboo term and topic in Europe today. This post-Shoah silence is both political and, until very recently, academic.1 The two books under review aim to break this silence by tackling the complex and entangled questions of antisemitism, islamophobia, and white (Christian or secular) supremacy and to demonstrate that racism in Europe cannot be separated from the question of religion (and I would add well beyond Europe). The essays collected in Antisemitism and Islamophobia in Europe: A Shared Story?, edited by James Renton and Ben Gidley, provide the rich histories and complexities concerning the race-religion intersection, in terms of [End Page 280] the shared stories of antisemitism and islamophobia, in Europe.2 Whites Jews and Us: Towards a Politics of Revolutionary Love, by Houria Bouteldja, is a passionate political appeal for action against the violence, exclusion, and power games experienced by excluded groups in Europe today.3 Read together, these two books offer a theoretical and applied analysis of racism in Europe today. Let me first provide the reader with a summary of the contents. When Renton and Gidley selected and edited this volume, based on the proceedings of a 2008 conference, what was their ambition? With the nuance of erudite scholars, nuance sometimes lacking in Bouteldja’s book, Renton and Gidley refuse to take up the question of the complex relationship between antisemitism and islamophobia in a reductive or simplistic manner. Is it possible to focus on similarities without sacrificing differences or vice versa? The approach chosen by the editors is, in this vein, judicious. “We have to excavate and concentrate on a shared story of evolution; in short, we need a diachronic framework, in which we can identify moments of beginning, change, separation (6).” The aim is thus to focus on how this relationship has changed or unfolded over time which leads to the four-part diachronic structure of the book: Christendom, empire, divergence and response. While I welcome the aim, it might have been too ambitious as it would have required more active engagements with the respective contributions and an editorial conclusion. As it is, several of the essays feel rather misplaced. This is unfortunate as the structure and aim creates possibilities that would have been both timely and relevant. One concrete example is that of antizyganism. While the editors, and several authors, mention discrimination against the Roma, none consider how the exclusion and persecution of Roma might be related and entangled in this relationship—precisely because of the diachronic structure, this might have been possible. 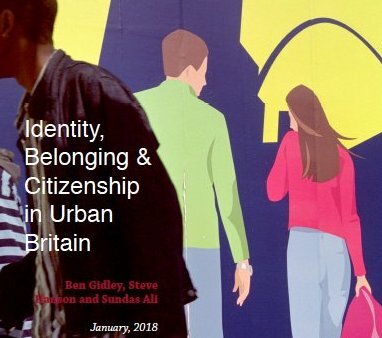 In this CUCR podcast, Les Back talks to Steve Hanson and Ben Gidley about their new report with Sundas Ali Identity, Belonging & Citizenship in Urban Britain (CUCR, 2018). This study of UK cities was conducted before the Brexit vote but in many respects it anticipated its outcome. In this report they argue that urban spaces can be characterised on a continuum with ‘English cities’ at one end and British cities at the other. They also talk about the politics of Englishness and urban multicultural conviviality and what makes a good city. The full report can be downloaded for Free here and copies are available from directly from CUCR. Steve Hanson’s book Small Towns, Austere Times: The Dialectics of Deracinated Localism is available from Zero Books. 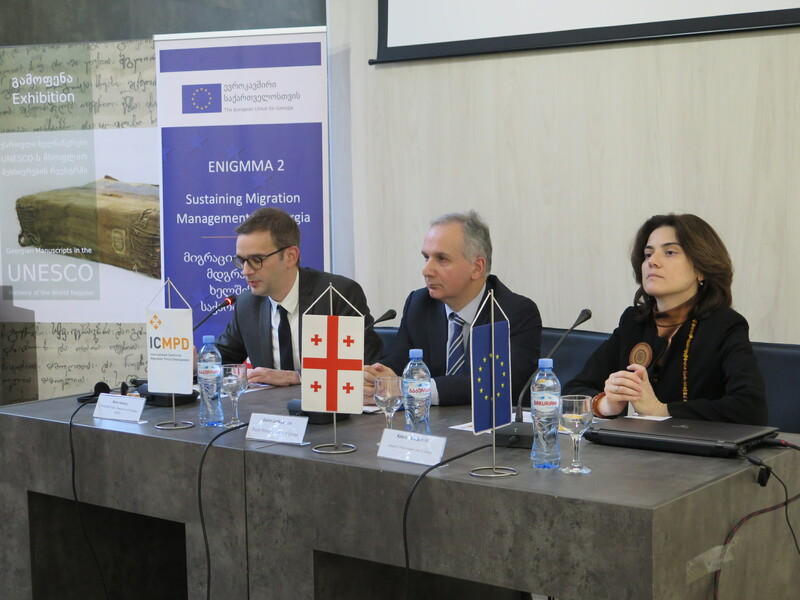 On 8-9 February 2018, an international conference “Dialogue on Migrants’ Integration – Challenges, Benefits and Good Practices” was held in Tbilisi, co-organised by SCMI Secretariat and ICMPD. The conference brought together local and international practitioners, policymakers and scholars to discuss best practices and lessons learned with regard to the integration of migrants within the EU Member States and in EaP area, substantiated by the global migration processes of the last decade and increasing need to agree upon and develop well-thought integration policy and practices in destination countries. I can’t believe it is ten years since we lost Paul Hendrich. Here I am posting: a remembrance of him I wrote for the CUCR magazine Street Signs in Autumn 2008, and below that a dedication I wrote for the book Pirate Strategies, edited by Adnan Hadzi, also published in 2008. I first met Paul when I was an undergraduate student at Goldsmiths, in 1995, a time in Paul’s life characterised at his memorial event by his wife Sasha as ‘partying, partying, partying’. Over a May Bank Holiday weekend, I travelled down to Brighton to visit my old school friend Laura Shepherd, and found myself at a party at what turned out to be Paul’s flat. I don’t remember the party very clearly, but I vividly remember us lying the following morning on the uncomfortable pebble beach, talking about soul music and anarchism in the weak English spring sun, while a Brazilian percussionist busked nearby. It would be a decade before I met him again. His talk at [the CUCR postgraduate conference] Failing Better, part of a wonderful session on pirates, struck an immediate cord with me. He got to know each other well when we were two of the five people who organised the Lewisham ’77 project, a walk, conference, concert and oral history project marking the thirtieth anniversary of the Battle of Lewisham. At one of our meetings at the Marquis of Granby pub, Paul mentioned Laura, our mutual friend, and the jigsaw piece of our earlier meeting in Brighton clicked into place. I remember telling my partner Vanessa about meeting Paul, and about instantly feeling certain that we would become friends, a rare experience in this age of emotional caution. to the genuine knowledges housed in the academy, while refusing the feudal authority and aura of credentialised expertise that constitutes the academy’s social power. was a rare spirit of openness. Oral history always reveals different, sometimes contradictory and occasionally incommensurate perspectives on the recent past, and this is especially so with political pasts, as old factional disputes throw their long shadow on the present and today’s battles are projected back in time. The anti-racist world is an exceptionally fractious one, and it was important that Lewisham ’77 recognised all of the contending histories. Paul’s generosity of spirit and disarmingly easy manner was vital in keeping the different parties on board. from the condescension of posterity. Paul’s work on the history of Deptford Town Hall, on the Battle of Lewisham and on present-day grassroots activists in Bisby was in this spirit. The stories he valued, to use a phrase of one of the Lewisham ’77 speakers, Martin Lux, were the footsoldiers’ stories, the stories of those normally consigned to the margins of history, not the stories of the leaders and celebrities. Paul was a footsoldier in this way; he derived no personal glory from his involvement in these projects, yet through them, and through the friendship with which he was so giving, he left the world a better place than he found it. A special edition of the on-line journal Anthropology Matters (tinyurl.com/55vchs) was dedicated to Paul’s memory, and includes an appreciation of him by his PhD supervisor Alpa Shah as well as Paul’s MA piece on Deptford Town Hall. Paul’s article “Over-Written in Stone” can be found in the Spring 2007 issue of Street Signs. The Deptford.TV book, Pirate Strategies (tinyurl.com/6af8ha), is dedicated to Paul’s memory. Appreciations to Paul also appear at the John Hutnyk’s weblo ((tinyurl.com/2nrvea) and Transpontine (tinyurl.com/5gdyzd). This book is dedicated to Paul Hendrich, who died at the age of 36 in January 2008. Paul was a South London-based activist, youth worker, family man and scholar. He was doing an anthropology PhD at Goldsmiths, University of London, on cross-border activists on the frontier between the US and Mexico. Paul’s interest in borders permeated his recent projects, and resonate with the Deptford.TV project. Like Deptford.TV, his work was about transgressing the border between academia and the “real world,” both in the local community of Deptford and New Cross and in the wider global public sphere. For example, he was one of the organisers of the Migrating University based at Goldsmiths in 2007. As part of the No Borders activist camp at Gatwick airport (campaigning for the freedom of movement across borders of the world’s citizens), the Migrating University brought a motley crew of activists and refugees into the space of the academy, opening up a very different model of pedagogy. (You can see footage of the Migrating University, including of Paul busily helping to make sure everything hung together, on the Deptford.TV archive.) A similar project in which Paul was a moving spirit in was Lewisham ’77, which commemorated the victory of local people and anti-racists over the fascist National Front in New Cross in 1977 – also documented by Deptford.TV as part of its commitment to recording the underground and alternative histories of the area. Paul curated the Deptford Town Hall Pirates project, which similarly aimed to reconfigure the relationship between the university and its neighbourhood. The project focused on Deptford Town Hall on New Cross Road, transferred from Lewisham council to Goldsmiths as part of Deptford City Challenge on condition it retained community access. Paul’s project was about making this community access meaningful. It also commemorated the histories of slavery and colonialism that made Deptford what it is – histories inscribed in the area’s urban landscape in the form of the statues of imperial naval “heroes” on the façade of the Town Hall: four men who were involved in the trans-Atlantic slave trade. But on the other hand, there is the piracy which Deptford.TV celebrates: the capture of social value back from the robber barons of capitalism for the benefit of the commons. In this spirit, Paul started a Pirate Society at Goldsmiths, temporarily capturing The Island (the traffic island at New Cross Gate) as an autonomous pirate republic in 2006. In Paul’s memory, long live the island! How have antisemitism and Islamophobia related to each other in different European contexts, historically and today? How can we understand this connection? How did the term “Semite” come to refer to the Jews, and how is it connected to the term “antisemitism”? Is Europe a secular continent – or a Christian one? And what does this mean for Jews and Muslims? 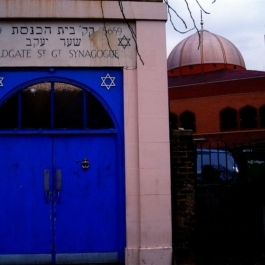 How can we combat antisemitism and Islamophobia together today? What historical resources can we draw on in building solidarity against racism? For details of the book, see http://www.palgrave.com/gb/book/9781137412997. Hosted by the All-Party Parliamentary Group Against Antisemitism. 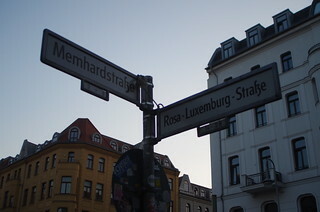 Co-organised by Monitor: Global Intelligence on Racism, based at the Robert Schumann Centre for Advanced Studies at the European University Institute. The event introduced and chaired by Nusrat Ghani MP, will include a short presentation of research by the co-editors, followed by a panel discussion and questions. Panellists will be Omar Khan (Runnymede Trust), Karen Pollock MBE (Holocaust Educational Trust) and Danny Stone MBE (Antisemitism Policy Trust). Please email Ben to register to attend. James Renton: Does Europe’s Far Right Hate Muslims the Same Way They Hate Jews? President Donald Trump’s retweeting of anti-Muslim videos propagated by Britain First has made millions more people around the world aware of the European far-right’s crude Islamophobia. Is this racism a retargeting of familiar tropes of anti-Semitic hatred? Or does anti-Muslim and anti-Jewish hatred have a more complex relationship, both in history and in our current moment? Prejudice toward Islam and Muslims is endemic in the Europe of 2017. The “Muslim Question” is central to the politics of the far right, which has achieved success unprecedented since WWII at the polls this year, from France to the Czech Republic via Austria and Germany. More significantly, the fear of Muslims as potential terrorists has become an integral part of mainstream European politics and the European security state, as has been identified by Amnesty International, among others. Several commentators and academics have argued that this groundswell of Islamophobia, which began in earnest with the “war on terror” after 9/11 and has gathered pace since 2015, has made Muslims the “new Jews” of Europe. They contend that today’s emergency is redolent of the anti-Semitism of the 1930s, or of the late 19th century. This argument is, however, inherently flawed. Comparing the two racisms in two completely different periods of history, jumping across time, misses entirely the complex evolution of the relationship between anti-Semitism and Islamophobia that has taken place over more than 1,000 years. This shared story produced profound connections, but also differences, and, by the middle of the 20th century, led to the apparent splintering of these racisms.